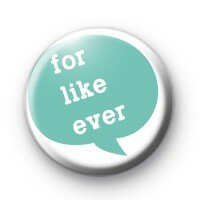 This is a listing for a white 25mm (1inch) button badge with a turquoise speech bubble and the text for like ever in a white font. This is a modern way of telling your partner how long you will love them for. Are you cool and in love?